With the help of Progresso™, I was able to create this sponsored post and bring you an easy recipe that will put a healthy dinner on the table in less than 30 minutes. Talk about a total win! 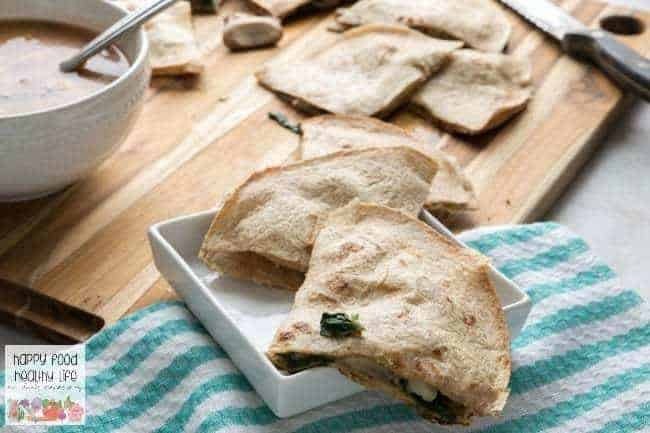 If you struggle with the desire to pick up dinner from the drive-thru again, think twice and whip up this Vegetarian Spinach & Mushroom Quesadilla. It comes together in no time, and your family will gobble it all right up! Every afternoon around 4pm, there’s this argument that begins to take place in my head. The argument is between the super tired woman who would love to get an hour nap before the evening hustle of homework, chores, showers, and bedtime and the responsible mom who would love to get a healthy and nutritious meal on the table for her family. So often, the super sleepy side of me really wants to order a pizza or call up my other half to pick up some fast food on the way home from work. Please tell me I’m not alone in this constant pull between responsibility and exhaustion. Sometimes I really just don’t want to adult and would be much happier vegging out on the couch with a bean burrito from the dollar menu. Unfortunately, this results in a whole lot of mom-guilt on top of the question of the evening, “what exactly is in this burrito? !” Am I right? I’ve been telling myself that I really need to come up with a large collection of insanely easy recipes that take no time or effort at all so we can stay away from the drive thru’s more often. Getting a home-cooked meal makes everyone happy, makes this mama feel like a winner, PLUS it gives us all leftovers for lunch the next day so we don’t have to go out to eat then! Total win. So in my quest for healthy meals, I’ve started looking at how I can supplement an easy recipe with something store-bought that I can get on board with. Most of the time, I’m all about home-made, but as you know, that just doesn’t always happen. So the second best option is to find products that use quality ingredients and are totally yummy for my whole family. With Progresso™ soups, I found a winner. There are so many options for my family and our various diets. I’m 100% vegetarian. My wife is somewhat but still loves meat. My son loves meat, but I still want to make sure he gets plenty of vegetables as well. 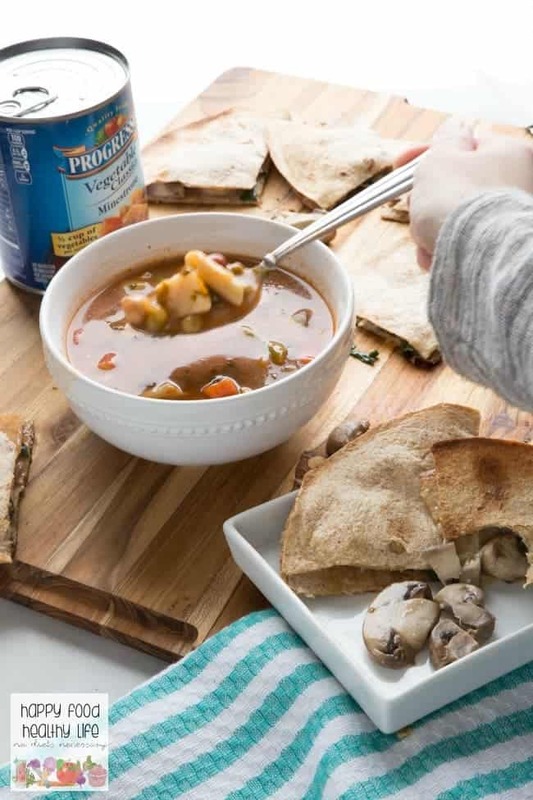 Progresso™ offers forty different soups that are low-calorie, and many are even vegetarian and/or gluten-free. I always get nervous reading ingredients lists on store-bought products, but Progresso™ soups totally fit the bill and put my mind at ease. The Vegetable Classics Minestrone soup I chose to pair with our meal this week is full of tons of vegetables and real ingredients that I’d make soup with at home. The only difference is that I don’t have to slave over the stove to get it on the dinner table. 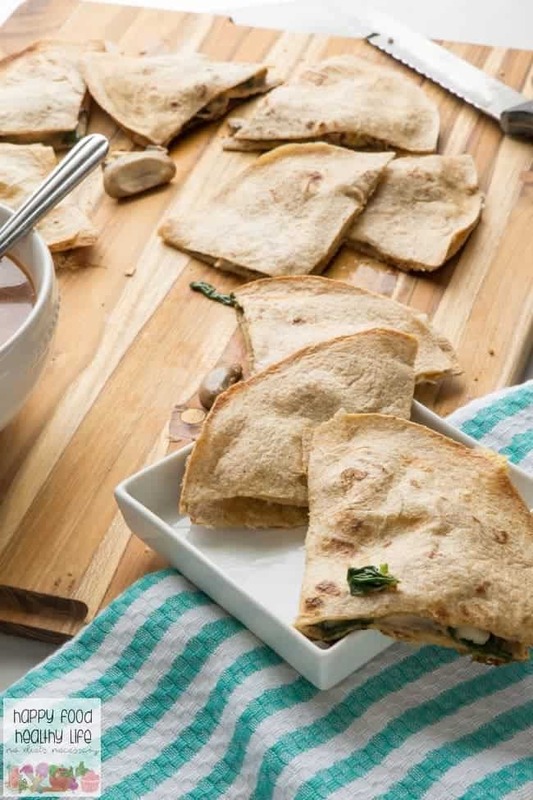 Pairing a healthy soup with a super quick and easy vegetarian quesadilla like the one I made this week is a perfect way to serve a balanced dinner, save time, and win the day. Heat oil in skillet over medium-high heat. Add mushrooms, spinach, and pepper. Saute for 3 minutes or until mushrooms are browned and spinach is wilted. Sprinkle 2 tortillas with cheese. Top with mushrooms, spinach, and remaining tortillas. Broil on baking sheet 2-3 minutes per side. If you liked this post, don’t forget to share on Facebook, Pinterest, Twitter, Google+, Yummly, or StumbleUpon with the buttons below! THIS POST IS SPONSORED BY PROGRESSO. THANK YOU FOR ALLOWING ME TO CONTINUE CREATING GREAT CONTENT FOR YOU BY SUPPORTING PARTNERSHIPS WITH SUPER AWESOME BRANDS THAT HFHL LOVES TO WORK WITH! AS ALWAYS, OPINIONS REMAIN 100% MY OWN. I'm Holly and I create real food recipes for real people. People who want to eat more than kale chips and tofu. People who are a little bit terrified of vegan food because - hello, what the F is tempeh and seitan, right? People who want to go plant-based but can't even imagine a life without cheese or ice cream. I'm right there with ya and am here to help you every step of the way. I can't wait to show you around! 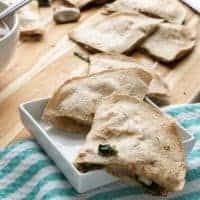 Let me help you with a week of dinner recipes in my free e-cookbook, simple vegan family dinners.